So it’s probably not a big secret that I hate my kitchen configuration. Whosoever decided to put a sink in a corner was high on something. It makes it increasingly difficult to reach into the back corner AND means a lot of wasted space. Instead of dreaming about the day I win the lottery, bump out the entryway, create a whole new kitchen and buy brand new appliances, I decided to do my best to cover the ugliest part of the sink: the cabinet. 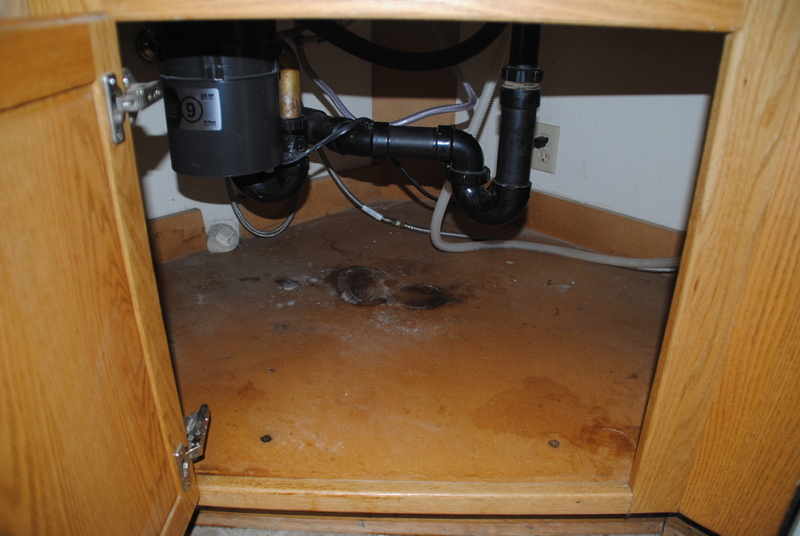 Not only are there a lot of unidentified stains but there’s water damage to the particle board from the time we had a hole in the food disposal and it created a little fountain under my sink. I didn’t much feel like putting in a new piece of wood and besides, anything that goes in here will need to be trimmed to fit since it’s such an odd angle. What once delivered me something of “necessity” from Amazon was hacked into pieces to become my new foundation. 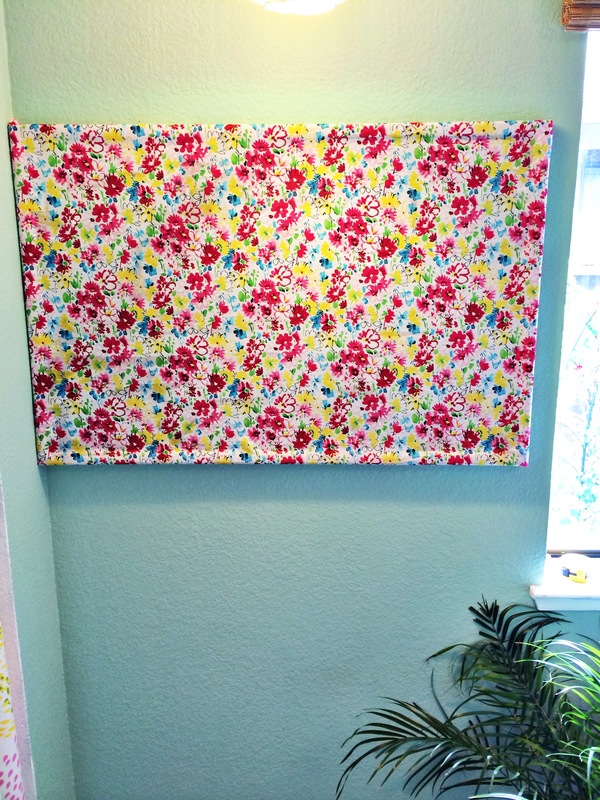 Since it was in so many pieces I used duct tape to create 2 big pieces, one across the back and one in front. It was a tiny bit tricky to get the two pieces to match up and overlap to create a semi seal but it worked. Trust me, I’m not entering this into blogger hall of fame. It’s a temporary fix so I don’t have to look at yucky stains all the time. 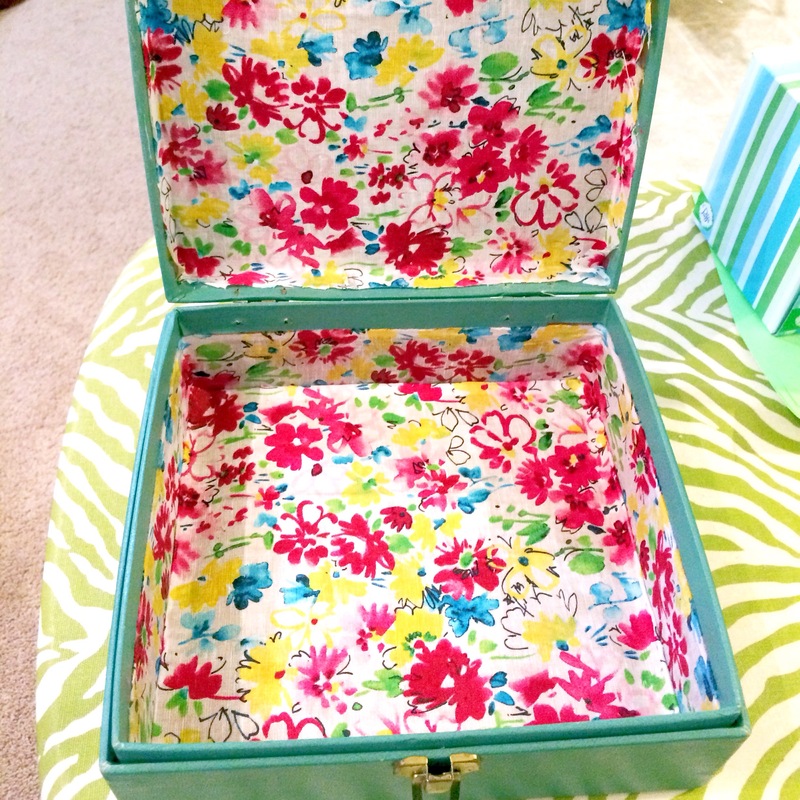 Best of all was that I had the contact paper already so this project was free! It probably took me a whole 30 minutes start to finish, including cleaning out my cleaning supplies and reloading the cabinet. Once all the crap is back in it’s pretty hard to tell there’s cardboard under there. Bonus tip: I use these cheapo baskets from the Dollar Store because when something is leaking you do NOT have the time to pull out 100 bottles. 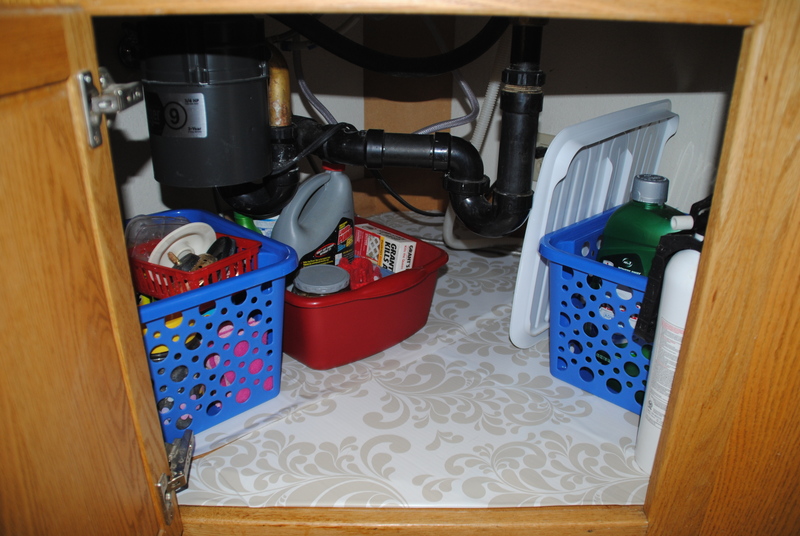 3 containers are easy to remove and if something is leaking inside that basket it’s much easier to clean up. And that’s it. 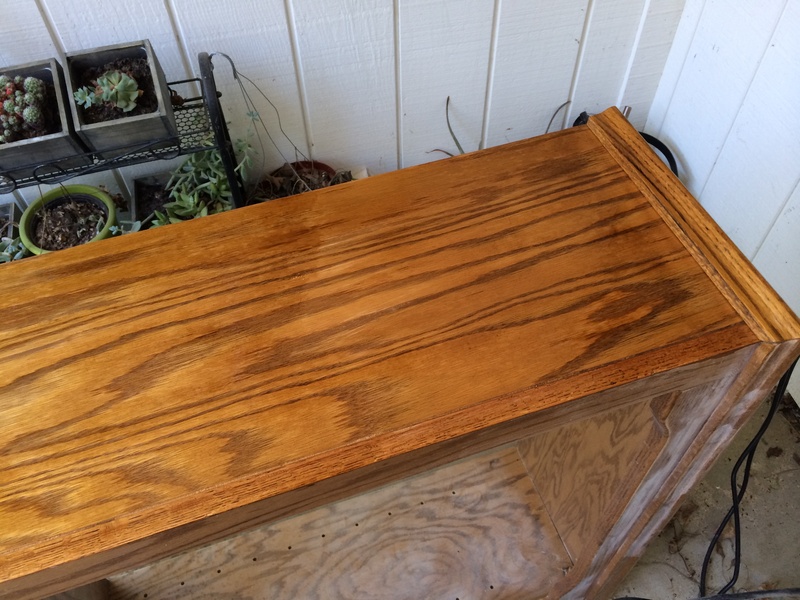 Super simple project, free, less than an hour and it makes the house look a tiny bit better. I was just going through my blog stats and was surprised that I posted way more than usual in May. Don’t get excited, I’m certainly not turning this into a full time (or even side) gig. The truth is that the more work I do on the floors and my continued schedule of workouts with a trainer, the more exhausted I am at the end of the day. Blogging about these projects is a great way to feel productive even when I need a nap. While it might feel like I’m in turbo project mode I think it’s just good timing that I had the funds to start some bigger projects this year. But I love the smaller projects too because it’s those little things that make a difference over years and years in a space. Even if the house feels chaotic right now because there’s furniture all over the place and baseboards sticking out from under the couch… it’s all good. I’m actually very thankful that most of these house projects took months (or years) of planning and saving. It’s much more fun than picking everything out of a catalog and being “done” a couple months after moving in. I’m also working on the office in preparation for a new computer (yay!) and the increased need for organization. While I’m loving these hardwood floors (actually laminate), Jackson is NOT a fan so I’m on the hunt for some affordable and beautiful rugs for the bedrooms & living room. He’s fine as long as there’s something for traction so I also have some runners for the hallway coming up. In other news, I’m on the search for some drought resistant plants for the garden as our water situation here in California is getting more dire and my bills are getting more expensive, even without daily watering. The lantana on the side yard is thriving so something similar that has low water needs would be fantastic. Personally I am ready to head into June and all that summer brings. It’s going to be a busy couple of months and I’m so excited for what the rest of 2015 will bring. I’ve kept it because it matches the desk that Grandma used to have and well, it’s pretty solid. But there were a couple of issues. As you can see above while it was nice to hold my printer and scanner the cords were always running around the edge which meant I was always tripping on them. 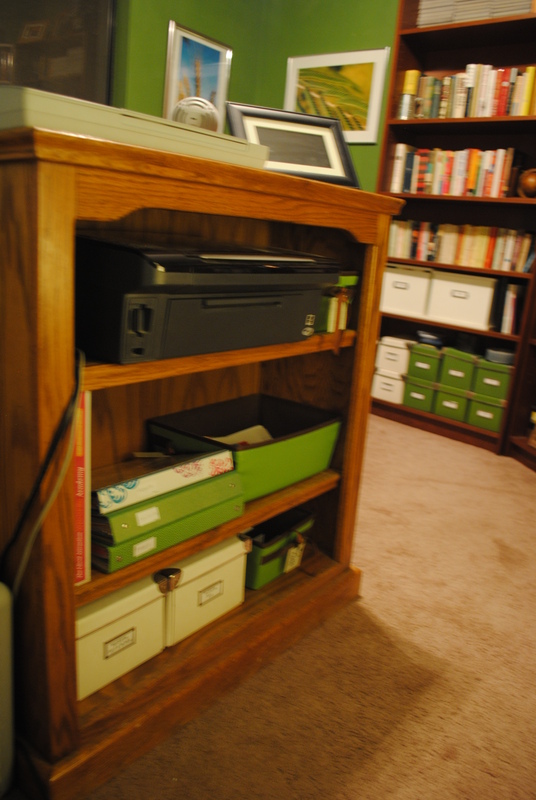 The two shelves were adjustable but I found it annoying to hold my binders so those are now on a different shelf. 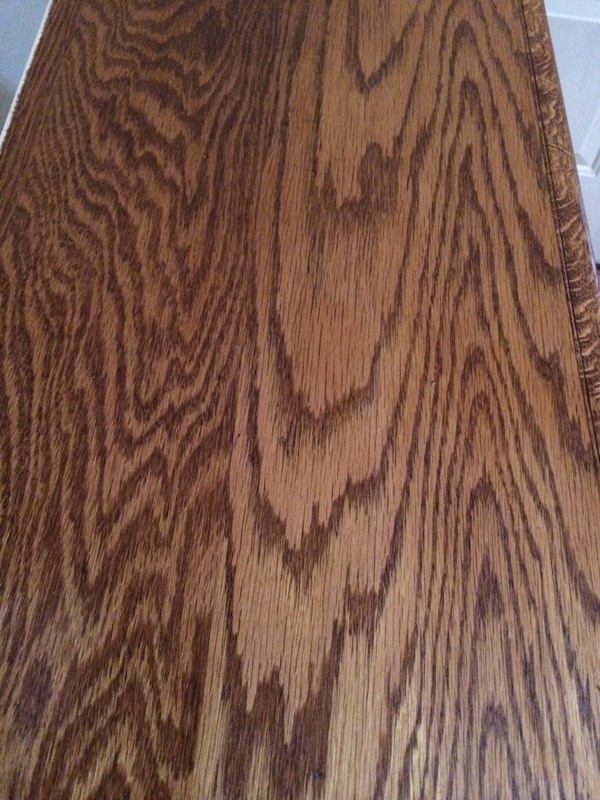 But the bigger problem was that the finish had worn away in many spots, leaving it looking old and tired. 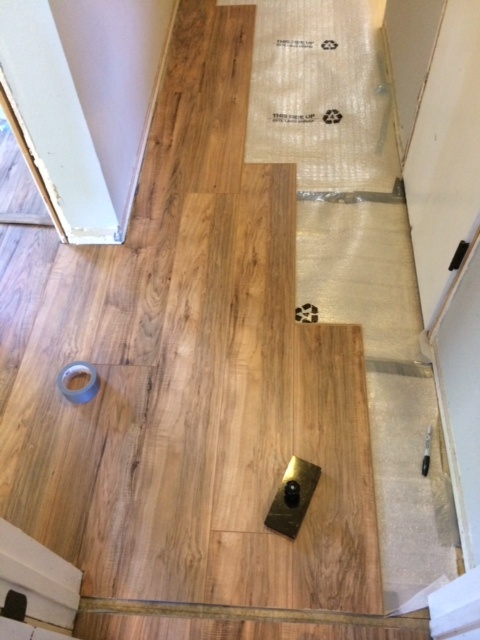 So after finishing the office floor with new laminate (looking above I do not miss that carpet!) I pulled this outside to begin working. The back piece needed to go, it wasn’t solid wood and had splintered in several spots. So I ripped it out, removed the finishing nails and staples as I went. To replace the back piece I picked out a piece of plywood – this one from Home Depot – it was much bigger than I needed so I used the rest of it for other projects. Before throwing out the broken back panel I used it as a template to trace the new piece and cut out the new piece with my jigsaw. 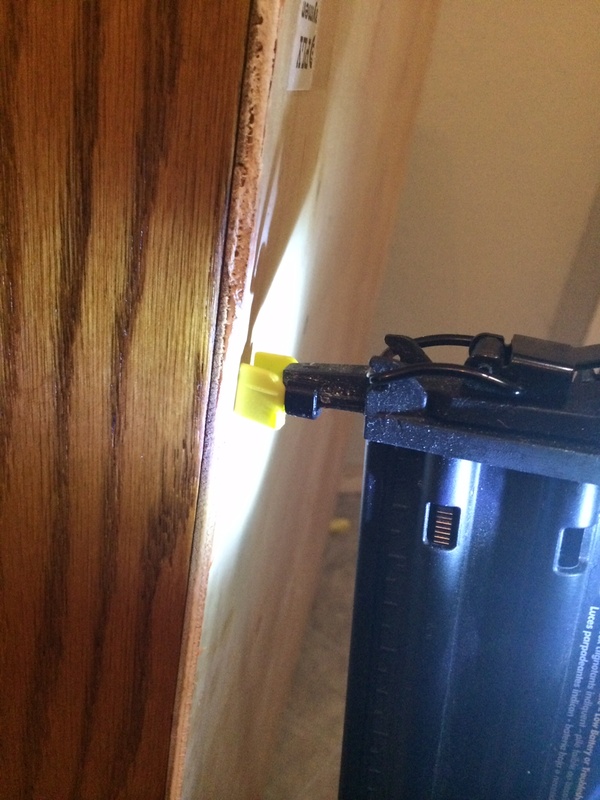 As you can see below I also notched the bottom corner so I can run cords through the back. The rest of the bookshelf got a good sanding with my B&D palm sander and then stained it for a fresh start. I thought about painting it but I really do like the wood finish and it was in pretty good condition already. 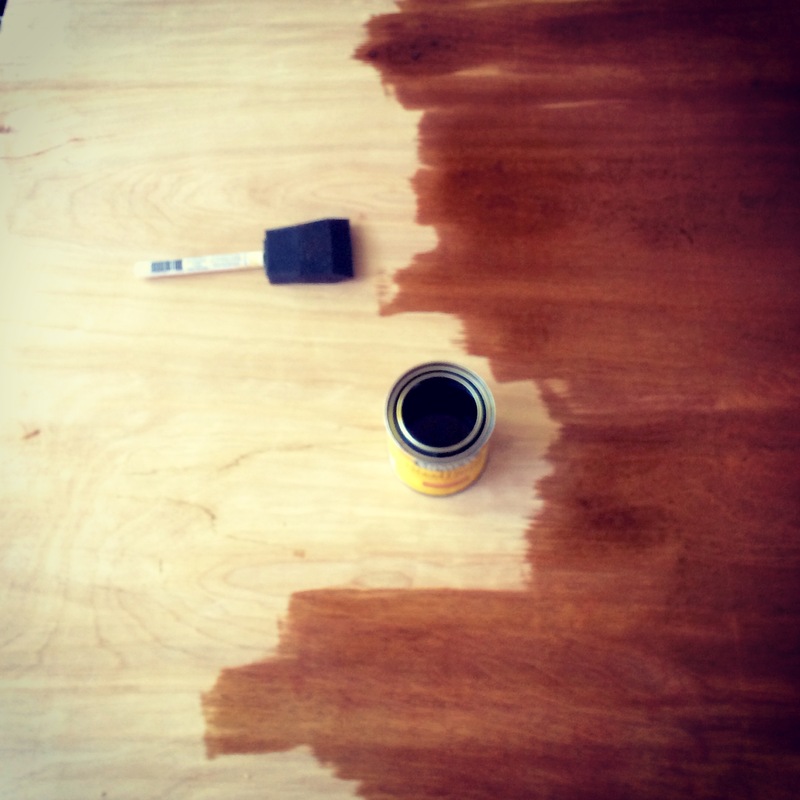 After staining the piece with Golden Oak from Minwax, I let it dry and then sanded it down with a 220 grit sandpaper. After the first layer of stain and then sanding, I did second layer of stain and let it dry overnight. Note: I picked up just a small 8 oz jar of stain and it was just enough! 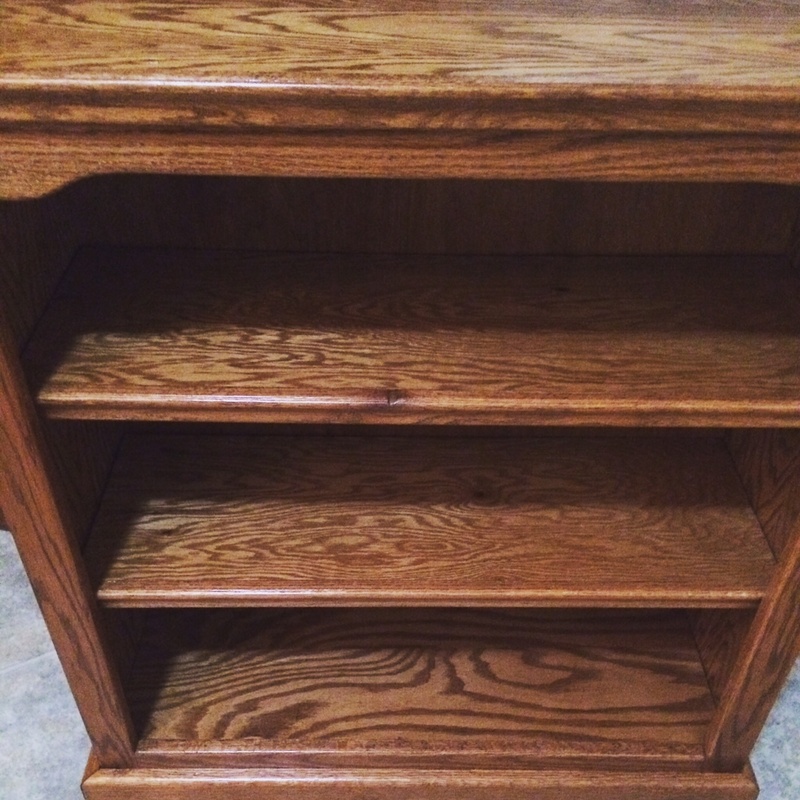 I had a little left in the bottom for another project but it covered great in 2 coats. 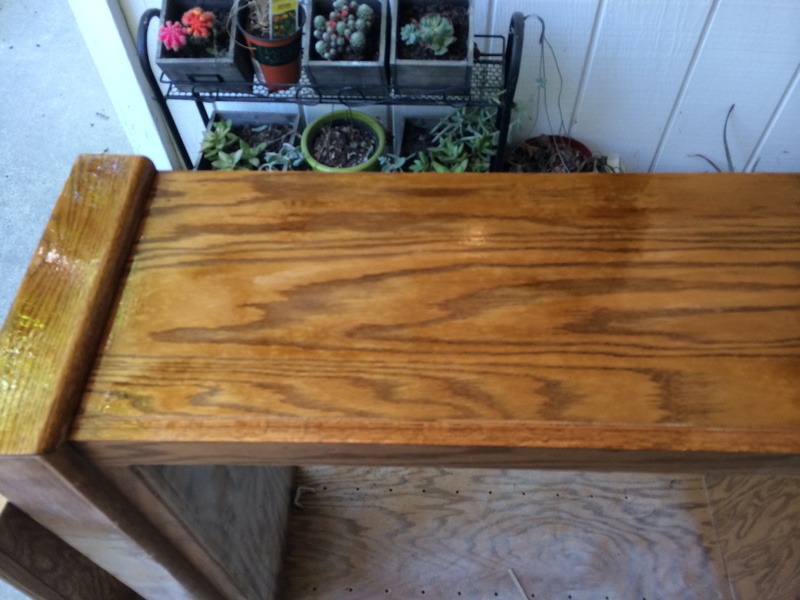 Last step was protecting it with polyurethane – I have this one from Minwax. After applying the protective finish it need 24 hours to dry and cure so it stayed right outside to off-gas. When that was done I was able to nail the back piece in using my Airstrike (which is seriously be best tool I bought all year!). Finally it was ready to move back in – of course the office is mostly in shambles due to work in the guest room but it’ll be in the final office reveal! One of my cheaper solutions for covering windows was the black curtains I hung over the garage window eons ago. The problem is that spiders have invaded that window sill and taken over command, meaning the curtains simply act as an anchor for webs and dead flies. Now I don’t mind the killing of flies but it was disgusting. And basically all you could see from the walkway outdoors is dead bugs and the web. It was so gross I didn’t take a picture because you’re welcome. I took down the curtains for their bi-annual cleaning and was surprised at how much light this little window let in. With the goal in mind to let in the light while maintaining privacy, I picked up this privacy film from Amazon that comes in a 17″ x 6′ roll. 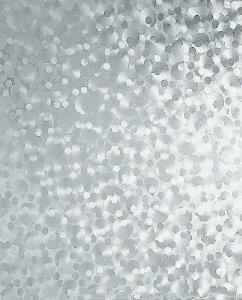 It has a really cool bubble looking pattern and is pretty easy to install. 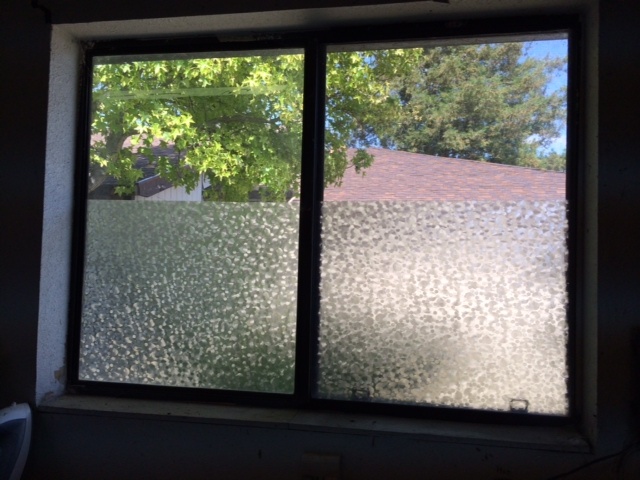 My window has two panels, each is 22″ wide and 36″ tall. 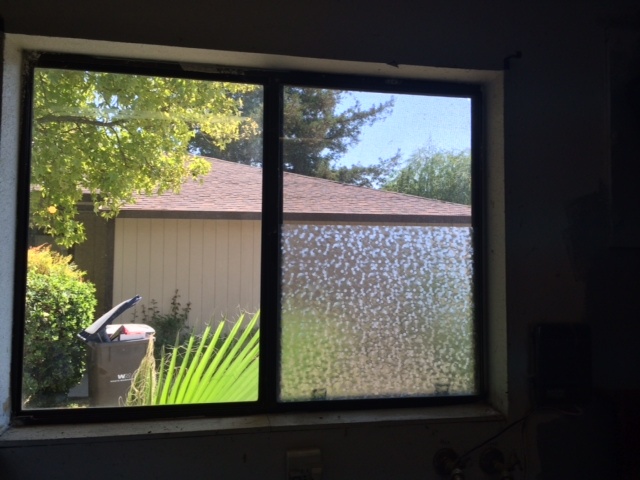 Since the film is just 17″ wide I decided to go left to right across the bottom of the window. 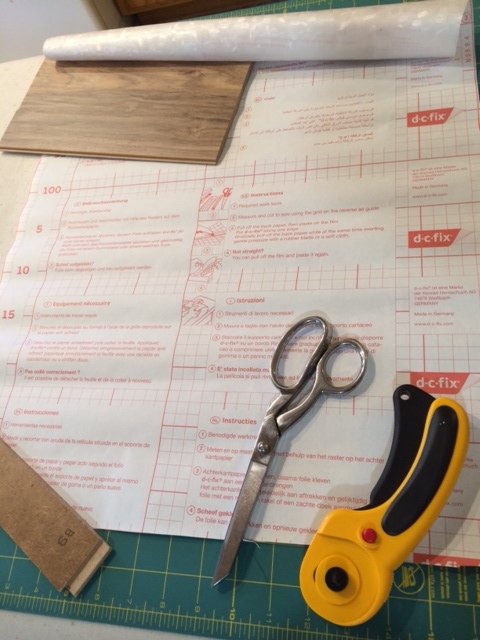 After measuring I rolled out the film on a cutting mat and pizza slicer thingy, I cut the film just a smidge more than 22″ for the first panel. As you can see the back of the film has this handy grid so you can cut a straight line. 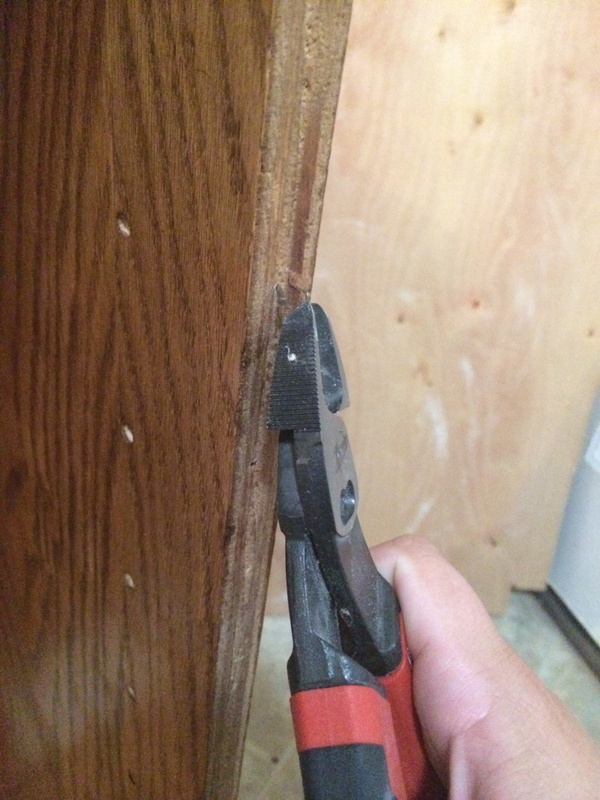 I used some scraps from the laminate floor to keep the cut straight. Since the film was cut a smidge too long I pushed it right up to the right side of the frame and then cut the last bit off with my box cutter. There are no pictures of installation because I was balancing on the chest freezer, peeling back the film, smoothing out the bumps and watching for spiders. It only took a couple minutes per side to complete. I love how much light is let in without showing what’s in the garage (my car and a bunch o’ tools). 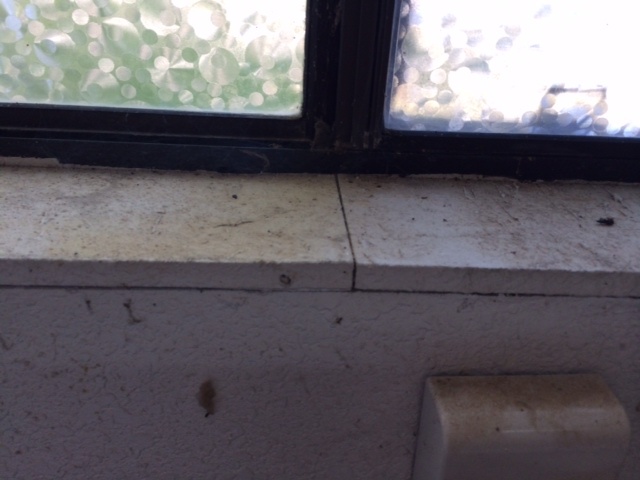 Of course nothing is ever finished so the next project is to replace the window sill and install a frame as the existing one is a little beat up. It’ll be good practice for working on the window sills and frames indoors. 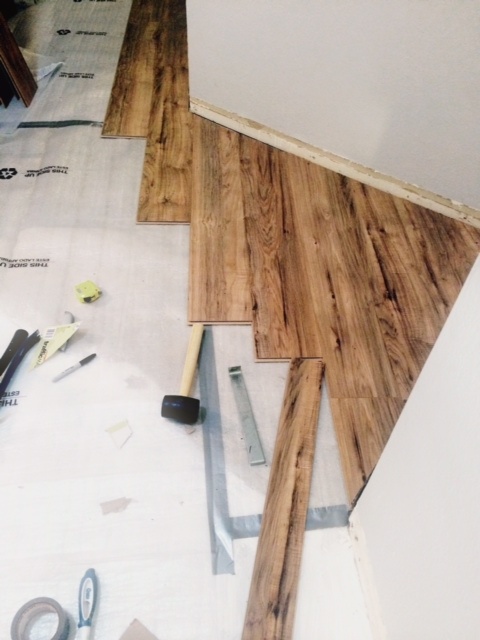 As I prepared to install the laminate in my guest room, I made it a priority to sort through allll the stuff that’s been lingering in there for years and make some decisions instead of just moving it around and resorting stuff into ever larger storage containers every couple years. Not only did I reduce my bankers boxes of paper from 4 to .5, but I was able to donate a bunch of stuff I no longer need or want and get a lot more organized. 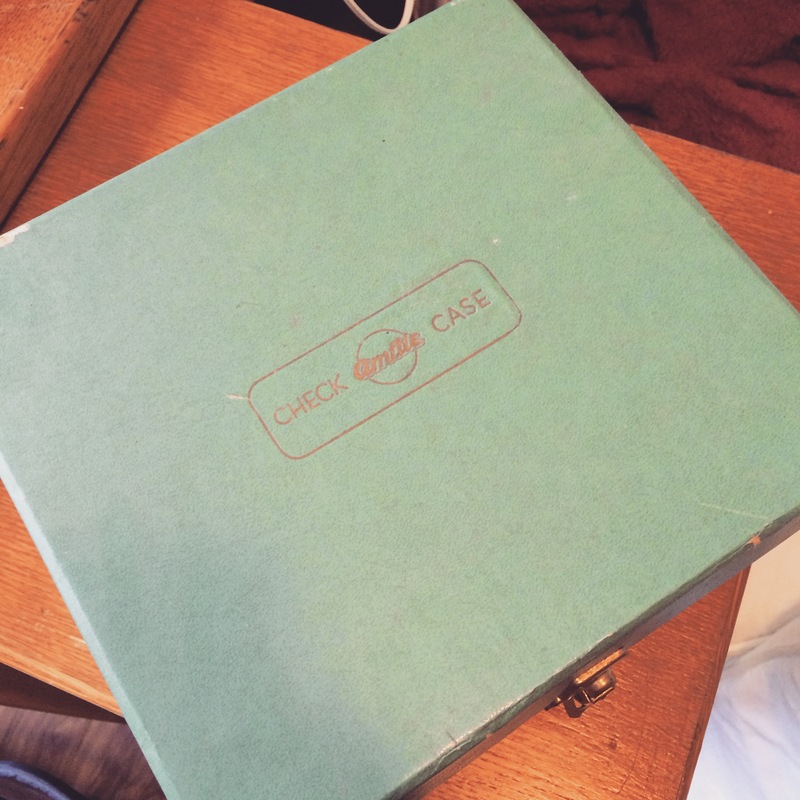 One of the treasures that I rediscovered was this check case that I inherited from my grandma. It’s not too big but I think she used it for storing bank checks. 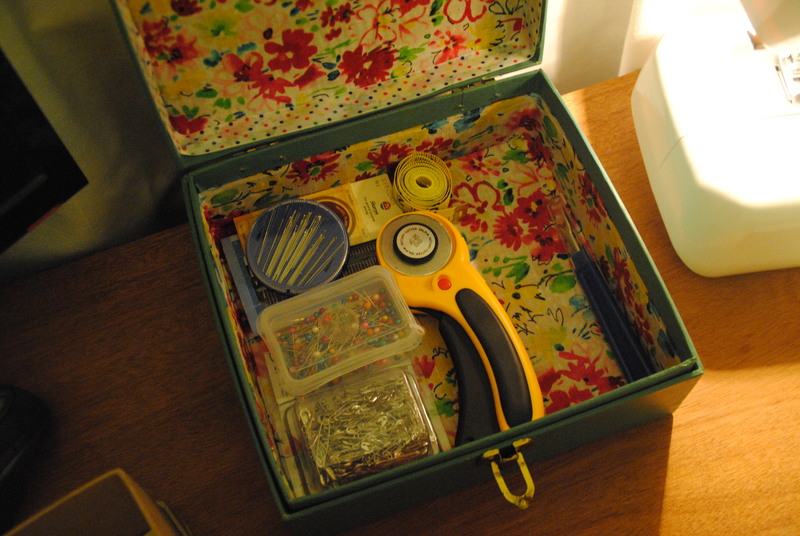 I’ve been using it for all my sewing notions and thread which, admittedly, I don’t use very often. But the inside of the case was pretty beat up and I wanted to beautify it. And decided it would work wonderfully. First I grabbed some spare cardboard and cut 2 pieces to fit the lid and the bottom of the box. I trimmed it a little bit so it would still fit once the fabric was installed. For the lid piece, I let the fabric hang over about an inch so it would cover the inside lip. 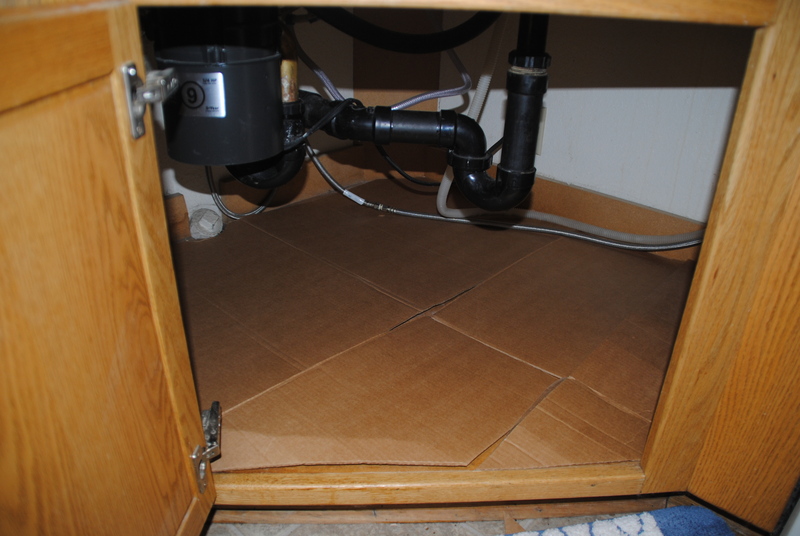 I used fabric adhesive to secure the fabric to the cardboard but didn’t really like it – too sticky. 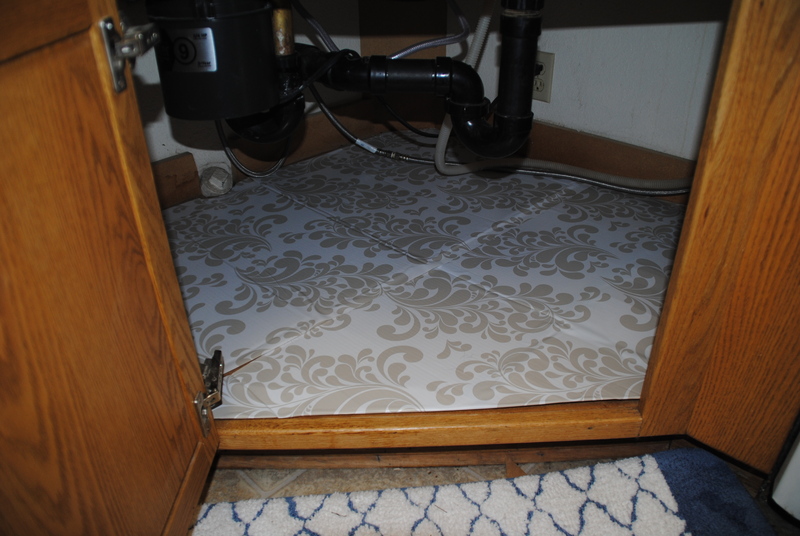 Still, I pushed the fabric and cardboard into place, then used modge podge to secure it to the lid. The bottom was a little different because the sides were taller. 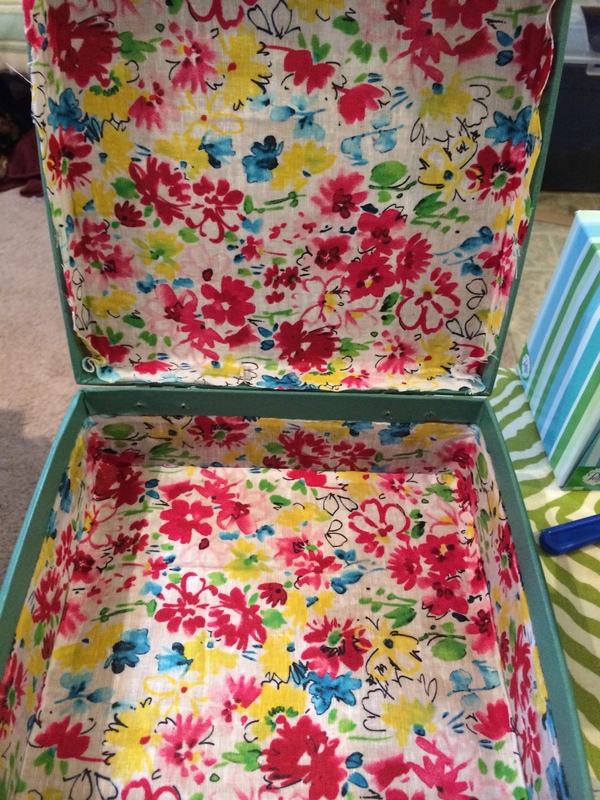 So I took a long strip of fabric and modge podged it in, letting the extra gather on the bottom of the box. I trimmed some of the excess and then pushed in the cardboard covered in fabric to secure the loose pieces. It’s a little hard to see but the cuts on the lid were too messy for my OCD tendencies. So I glued everything in tight with modge podge and let it dry for a couple hours. Then I grabbed a ribbon that was (I kid you not) left over from college and glued it to the lip of the lid to cover the gap. The outside has stayed the same, even the side where my grandma wrote “Disks” making me think she used this for cassette tapes or floppy discs. but have since decided that it needs to stay in the office with the pinboard and hold something office-y. I’d show you a picture of it hanging out in the office but since that room has all of the guest room stuff it’s kinda buried. I know, bad blogger. But I will be shooting the office (and guest room!) soon for a reveal post once those floors are d.o.n.e. I can’t wait. But I have to. Boo. 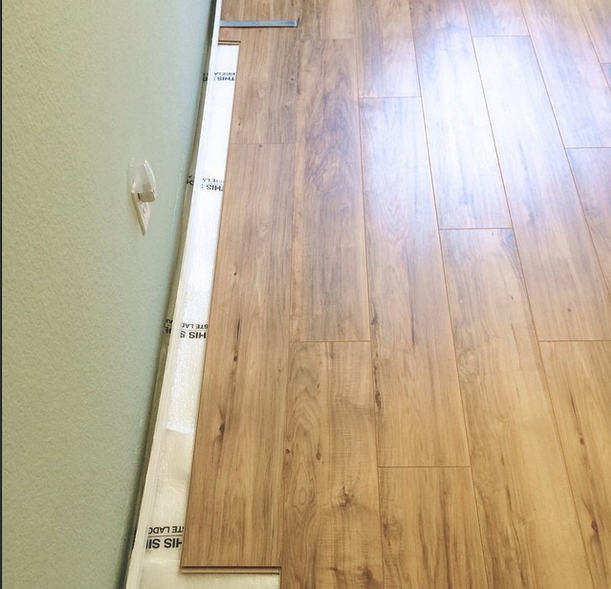 After finishing the master bedroom floor and starting on the office, I took some time to remove the baseboards and door frames from the hallway. There was a lot of wood to remove. The problem is that wall once housed a very ineffective bookshelf that I demoed the first week or so of living here and thus the texture on that wall is pretty bad and doesn’t match the rest of the walls. 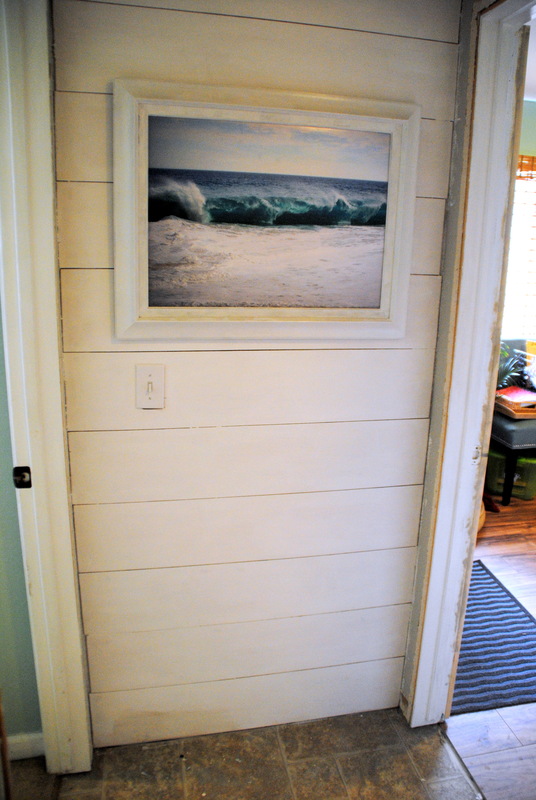 Instead of trying to skim coat or repair it to match, I had the brilliant idea to install wood planks and paint them white. 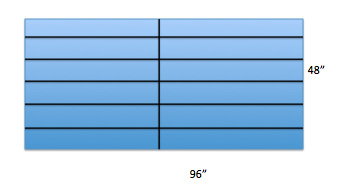 The last row is a bit under 8″ but it should do fine for the bottom row. 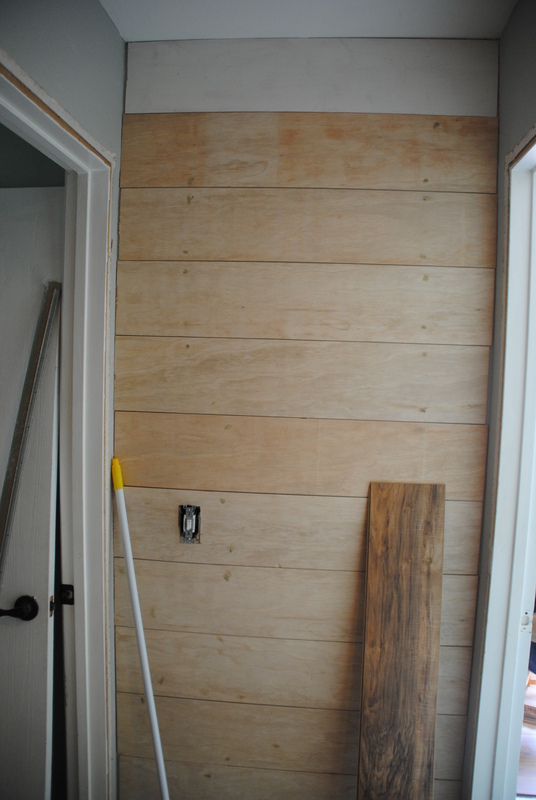 First thing on Saturday I started by sanding the edges of the plywood to smooth it out and then measured the wall to make the width cuts. I did paint one of of the boards with Kilz first but found that it was going to take forever to paint them all and let them dry on sawhorses outside. So I moved ahead with installing them top to bottom with 2 nickels between boards for spacing. As you can see from the wall board leaning up there, the panels are the same width as the floor boards (which are 7-5/8″) so that’s nice for symmetry. These boards are super light weight so holding them up to nail in was super simple. The only board that was a little harder was cutting out for the light switch because it happens in the middle of a board. 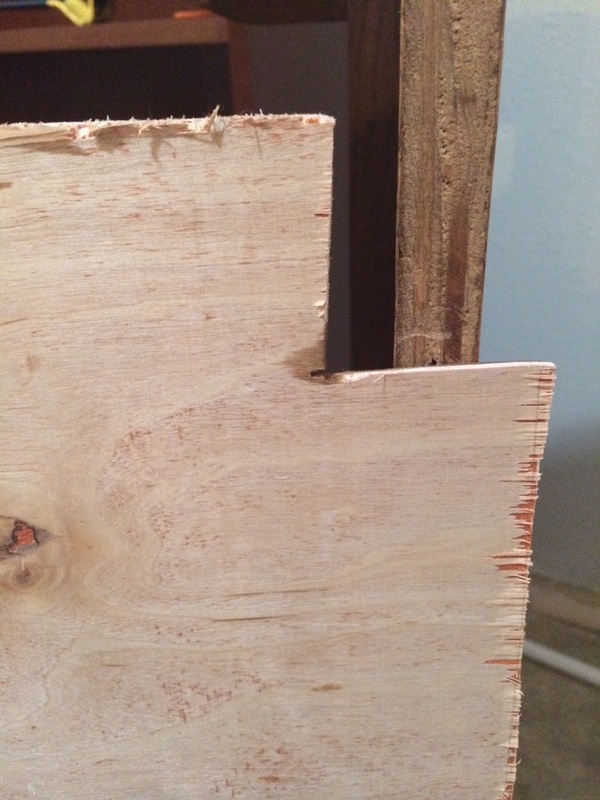 Using a drill bit I first created a hole and then used my jigsaw to cut out the box. 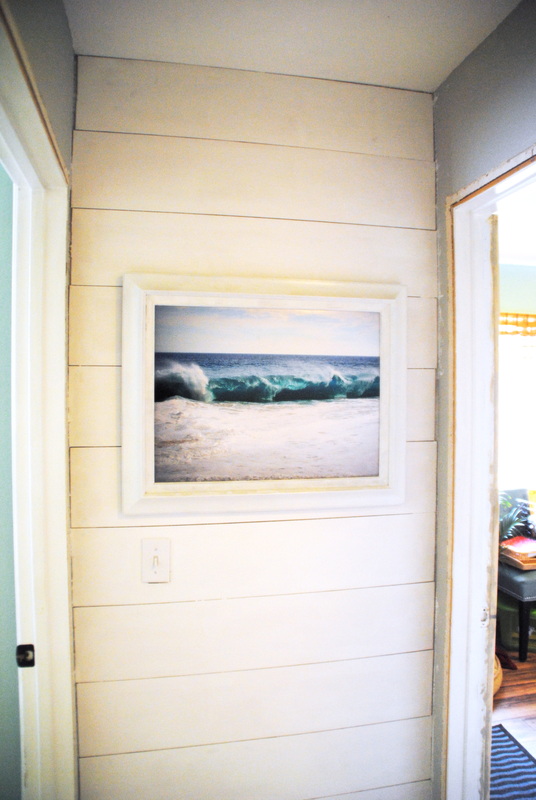 Thankfully it worked out better than the beadboard in the bathroom. 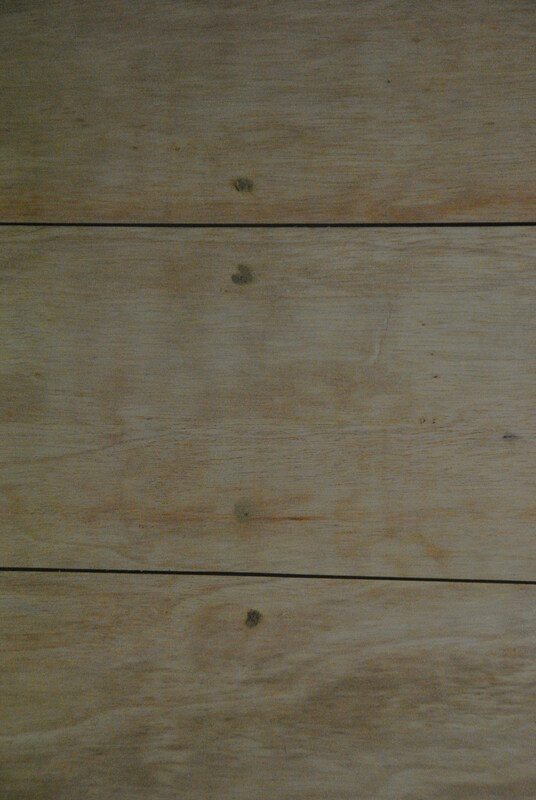 After the wood was installed I pulled out the wood filler to cover the nail holes and then sanded them down. Easy enough. THEN I pulled out the Kilz primer and gave it a once over. Again, since I’ll be replacing the floor and adding new door trim on either side of the wall I didn’t have to be too careful with the paint. After the first coat I sanded the whole wall to grind down the wood filler a bit more and there were a few panels that needed another nail. Final step and that is the real layer of paint, the same white that I’m using on all the trim, in flat. I only have glossy for the trim so I picked up a quart. 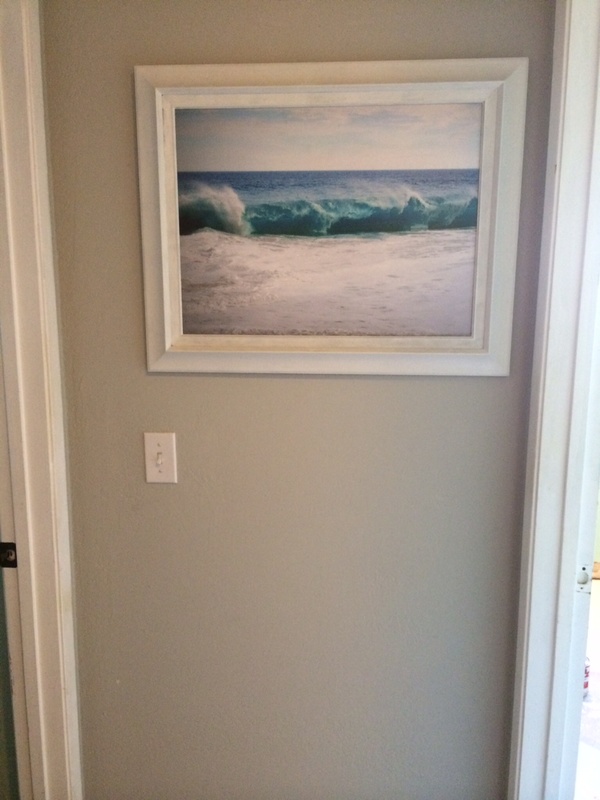 Once that dried I rehung the canvas that I built from a picture I took in Cabo last year. The old wood frame I rescued from Goodwill and painted is holding up pretty well so I am happy to have it back on the wall. I need to touch up the paint on the bottom panel but will soon be installing the new door frame and reinstalling the baseboards.